As President Trump prepares to impose tariffs on steel and aluminum imports to the United States, polling results show tariffs are unpopular with Americans and Trump’s notion that trade wars are good is unbelievable. “Poll results suggest Americans disapprove of steel and aluminum tariffs proposed by President Trump out of fear they can raise consumer prices, invite trade retaliation and put US jobs at risk in a trade war." “Every listed party, gender, education, age and racial group oppose steel and aluminum tariffs, except Republicans, who support tariffs by a lackluster 58 - 20 percent and white voters with no college degree, who are divided with 42 percent supporting tariffs and 40 percent opposed,” according to the poll. "Tariff, smariff, say voters who believe punishing other countries on imports will do more harm at home," said Tim Malloy, assistant director of the Quinnipiac University Poll. “American voters disapprove 54 - 34 percent of the way President Trump is handling trade. Only Republicans and white voters with no college degree approve his handling,“ poll results show. The strongest disapproval rate is by Democrats. 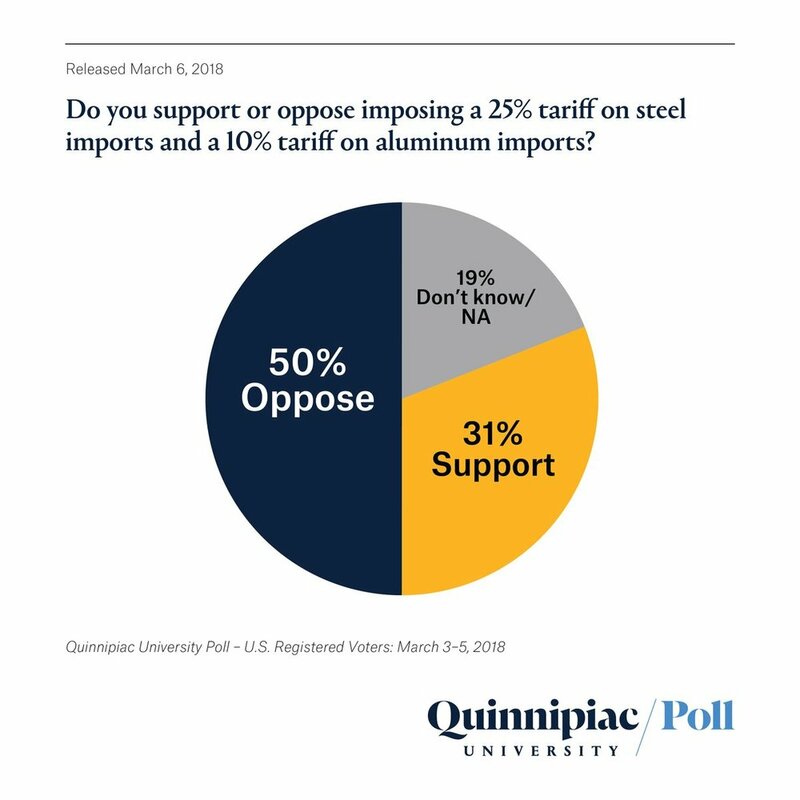 Eighty-five percent disapprove of Trump’s handling of trade and 73 percent oppose the steel and alumni tariffs. Sixty-eight percent of black respondents disagree with the tariffs. There is a sharp divergence between college-educated respondents who strongly oppose tariffs and non-college respondents who lukewarmly support them. The same poll asked about the National Rifle Association and its influence on gun violence legislation. In response to a question about whether Republicans in Congress are afraid of the NRA, 70 percent of GOP respondents said “no” and 83 percent of Democrats said “yes.” Older Americans and African-Americans were much more likely to view congressional Republicans as fearful of the NRA and its grassroots political power.